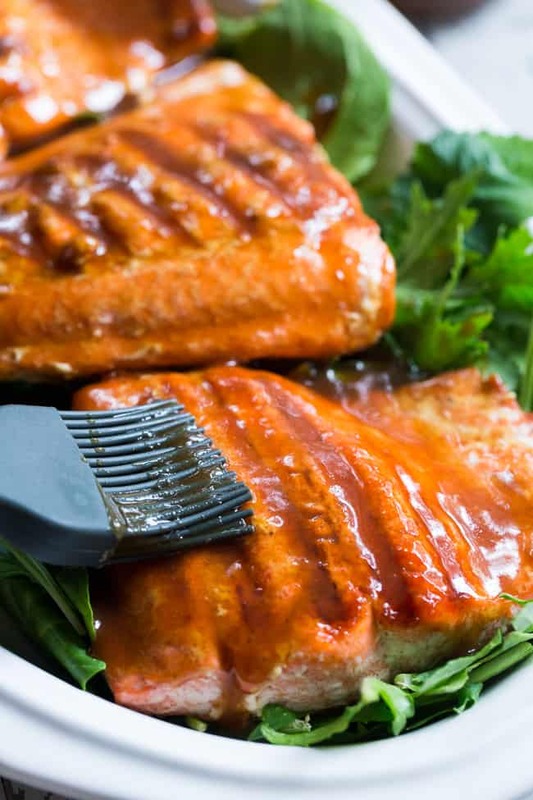 This Paleo and Whole30 Grilled Teriyaki Salmon is incredibly easy and packed with flavor! 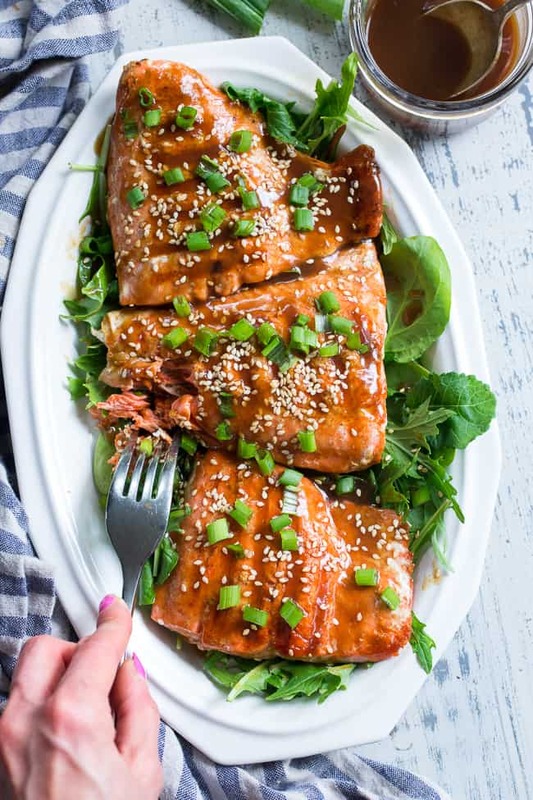 A simple date-sweetened teriyaki sauce is drizzled all over perfectly grilled salmon fillets and topped with toasted sesame seeds and scallions. 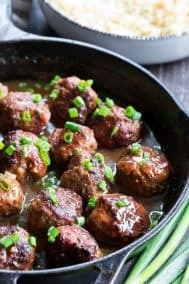 Perfect over a green salad or cauliflower rice! When I first started eating paleo way back when (almost 5 years ago) I ate salmon literally every single day. I LOVED it (still do) and would buy pre-portioned fillets and pan-fry them in ghee, crispy skin and all. Usually I threw it over a green salad with the works and came back for the same meal daily for lunch. 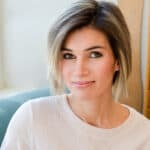 Then, something happened – I started cooking paleo for the entire family – not just myself. And I quickly realized two things: a.) cooking paleo for a family is NOT budget friendly if you don’t know what you’re doing and b.) no one but me liked salmon in the family. You might be wondering how these two things are connected, so of course, here it comes. Due to these two factors, I basically stopped eating salmon altogether. You see, I felt like since I was spending a boatload on groceries, I needed to cut down on the pricey stuff. Which was a good thing in a sense, since it allowed us as a family to eat better while sticking to a budget. However, I decided that my daily salmon lunches had to be sacrificed, or at least greatly reduced. I’m starting to realize this makes very little sense – in truth it really does not. I could’ve easily continued to make myself a weekly salmon lunch. 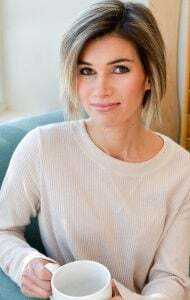 But, once the habit was broken, it just sort of stopped, and since no one else missed salmon by any means (they never ate it to begin with), salmon fizzled out of my life along with daily avocados, daily GT’s Kombucha, (I started making my own) and pricey cuts of steak. All of the above was replaced with ground meat x 100, chicken thighs (definitely not complaining) and sweet potatoes cooked 34057 ways. Again, I’m not complaining – with the addition of fried eggs and kale, this is what I live on to this day! 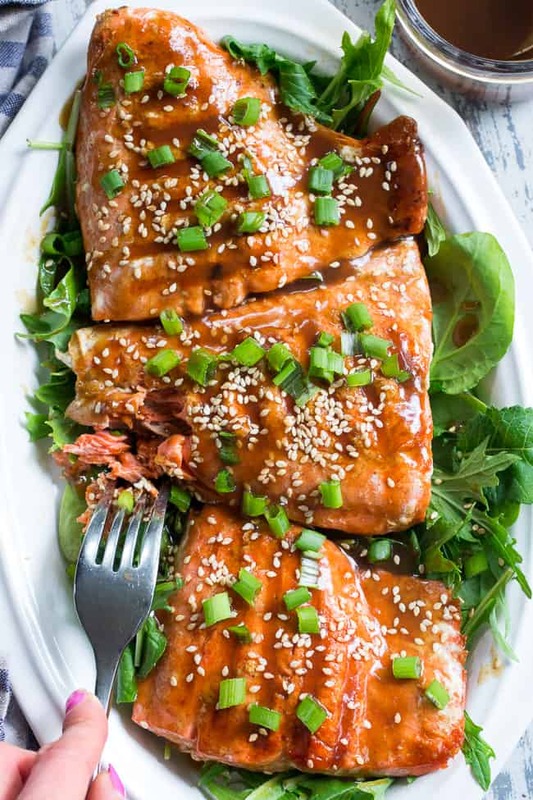 But more recently I started missing salmon – and now you probably see where this is going – after all, this post is devoted to grilled teriyaki salmon! I decided it was time to bring it back, especially given that I literally had not one salmon recipe on the blog until now. So embarrassing, really. So, this is no ordinary salmon, just so you know. It’s kid friendly (surprisingly enough!) AND Whole30 compliant since I sweetened my teriyaki sauce with dates. 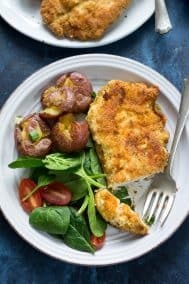 It’s incredibly easy and can be made on an outdoor grill or indoors on the stovetop with a cast iron skillet. I love my cast iron grill pan for when I want to replicate the flavor of grilling outdoors. 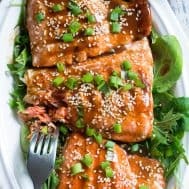 This teriyaki salmon is awesome over a green salad with tomatoes, avocados, and lots of sliced scallions but it would be really delicious over cauliflower fried rice too! 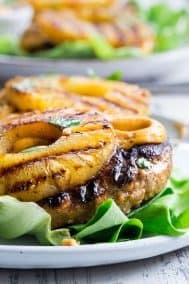 I hope you’re ready for a healthy meal with tons of flavor – let’s grill! 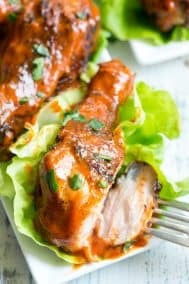 This Paleo and Whole30 grilled teriyaki salmon is incredibly easy and busting out with flavor! 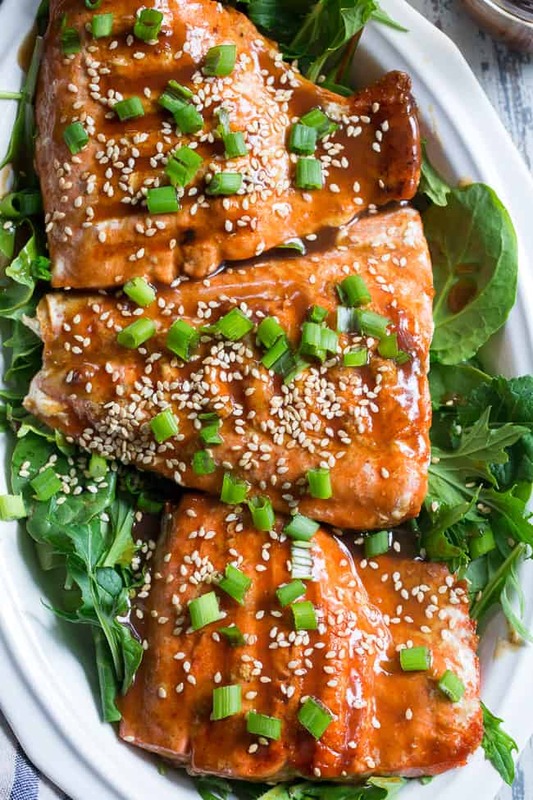 A simple date-sweetened teriyaki sauce is drizzled all over perfectly grilled salmon fillets and topped with toasted sesame seeds and scallions. 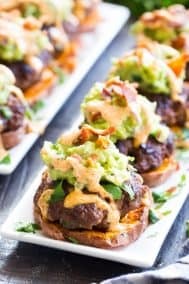 Perfect over a green salad or cauliflower rice! Place dates in the very hot water and allow to soak for a minute. Pour water and dates in a high speed blender or food processor, then add the coconut aminos, vinegar, garlic, and ginger. Blend well until smooth, then pulse in the arrowroot or tapioca. Pour mixture into a small saucepan and set over med-high heat to bring to a boil. Once boiling, lower the heat to medium/med-low and allow to simmer another 5 minutes or until thick and syrupy. It should be reduced to 1/2 cup once done. Keep warm while grilling salmon. Pat salmon fillets dry and season with salt and pepper on the top side. heat grill or stovetop over high heat. Brush grill or grill pan with the coconut or olive oil. Once smoking hot, add fillets skin side down (or bottom down, if skinless) and cook 2-3 mins. If your fillets have skin this will crisp it up deliciously! Carefully flip salmon using tongs and grill the second side for another 2-3 mins depending on the thickness of your fillets. Salmon should easily flake with a fork when done. Using the tongs, carefully remove fillets to your serving platter. 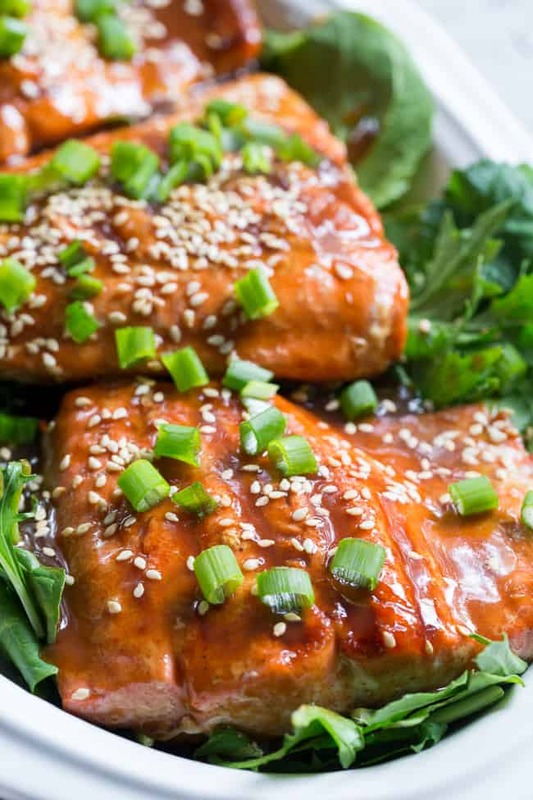 Spoon or brush the teriyaki sauce all over the salmon fillets, then top with toasted sesame seeds and sliced green onion. Serve over green salad or with cauli rice or grilled summer veggies. Enjoy! 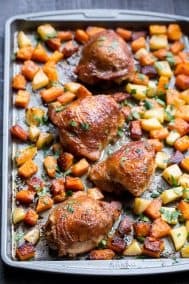 Want More Whole30 Friendly Dinner Recipes? Try One of These! So this teriyaki looks amazing!! Think it will work with chicken? I may test it out. Let me know what you think. Thanks! Haha were it’s good for chicken too! Or anything, really, but yes I do love my salmon! Thrilled everyone loved it! Love salmon and can’t wait to try this recipe! I had to stop eating to say, this is DELICIOUS! The sauce is amazing!!! I love that it’s sweetened with dates and it’s so much better than anything you could buy. I’m feeling so good right now that I’m eating something good for me and it tastes so good too. Thank you! Hi! Where does the flour go in? I don’t see it in the recipe? 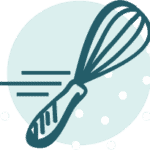 Could coconut flour with? 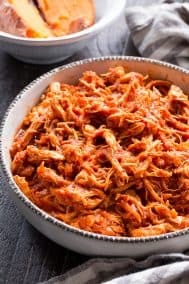 This was so easy, so delicious, and we feel satisfied and fantastic after having eaten it. Thank you so much!